In a large, deep skillet, heat the 2 tablespoons of vegetable oil. Add the bell peppers and cook over moderately high heat, stirring, until softened, about 10 minutes. Add the jalapeño, onion and garlic, cover and cook over moderate heat, stirring occasionally, until softened, about 5 minutes. Add the Braised Pork Shanks and gravy and cook for 3 minutes longer. Arrange the tortillas on a surface and spread a thin layer of goat cheese over each one. 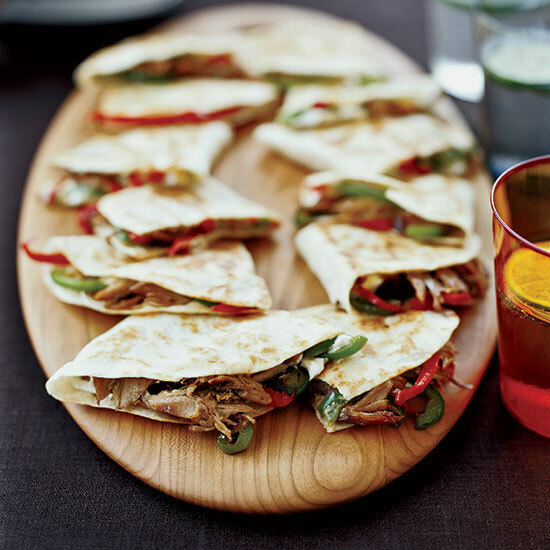 Spoon the pork and bell pepper mixture over the goat cheese and fold the tortillas in half. Brush the tortillas with oil. Heat 2 large skillets and preheat the oven to 300°. Working in batches, cook the tortillas over moderate heat, turning once, until crisp, about 7 minutes. Transfer the quesadillas to a baking sheet and keep warm in the oven. Cut the quesadillas in half and serve right away. A South American Sauvignon Blanc would pair nicely here; its grassy overtones are great with tangy goat cheese. Chile's Casablanca and San Antonio valleys have arguably become the country's top Sauvignon Blanc sources.